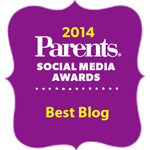 I am so proud to tell you that Gavin is doing so well in school. I am also proud to tell you that I am doing MUCH better with Gavin BEING at school - but who cares about that. Let's talk about how awesome Gavin is doing. Miss Megan, Gavin's teacher, takes photos of him occasionally and emails them to me. I never expected that but, as you can imagine, I feel like I win the lottery every time I get a new one. It's like a tiny glimpse into his day. And the images are much better than the ones I get from my perch in the tree across the street. I really need to ask Santa for a longer zoom lens. Anywayyyy.....I got permission from Megan to share these photos on my blog! Woo Hoo! The first three photos were taken during the first couple weeks. 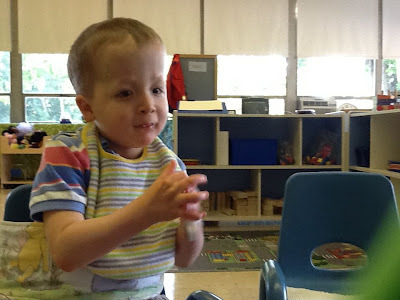 Gavin has been participating in circle time by pushing a button to say hello when asked...and also making choices to tell everyone what song he'd like to hear! 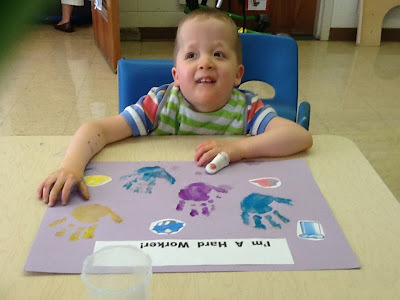 They do lots of craft activities which is good for Gavin in so many ways. It forces him to sit and participate...to use his hands with or without help...and to work with different textures. So far they've done things like cutting with scissors, working with glue, using dot markers, finger painting and shaving cream play! 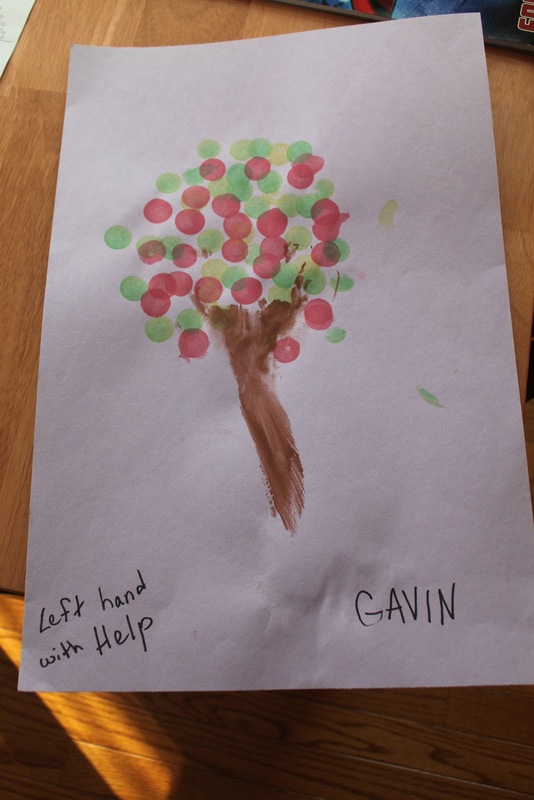 Everyone is trying to encourage Gavin to use this left hand, which you can usually find in his mouth. There's really only been a small amount of times that Sara has told me he resisted doing the craft projects. Typically when someone has to hold his hands on the dot marker or scissors or whatever to "force" him to do it. But most of the time she reports that he is doing a great job and letting people help him! Hooray!! As you can see - he seems pretty proud. I brought in another car load of toys, puzzles, lacing beads, stacking blocks and more today - courtesy of my uber-generous neighbor, Patti. The teacher and therapists were so grateful - it's always nice to have new things to work with!! They are also working hard on self feeding. Gavin's occupational therapist, Erika, told me they started using the "Easie Eaters Spoon" with him, so I jumped on Amazon and bought it. It's very cool and makes it much easier for him to get the food into his mouth. Today they also worked on a craft project- making an apple tree with paint and dot markers. He wasn't a willing participant, so I was told. They laid him on his belly and tried to get him to use that left hand again with the dot markers and he fought them through the whole thing. But there's no denying that the end result is beautiful. Maybe he'll be a famous moody artist!! 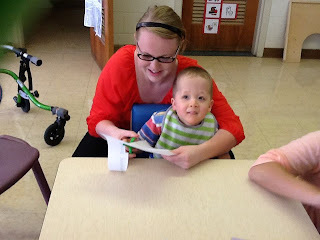 Whitney, his speech therapist, has been working hard on communication. She's trying to incorporate his iPad into as many classroom routines as possible (ie: circle time, greetings, taking turns, etc. )...encouraging him to communicate in any way when he wants her to continue an activity (ie: bouncing on the ball, singing, etc) by touching her or gazing at an object. She's also working on lip closure, which is important for eating AND future speech. Just like Miss Maggie did, she works with bubbles and has Gavin pucker when a bubble comes close to his lips. And she also puts crushed Ritz crackers on top of his pureed food to encourage him to close his lips. Megan works with him to match colors, stack, put objects in and out of containers, and so much more. Sara tells me she is a wonderful teacher and a lot like Miss Janna - who, as you know, Gavin just adored. He really is so happy in her class!! Today she celebrated his birthday by having everyone sing to him, presenting him with a certificate and taking his photo next to a big light up party hat! How cool is that!! Sara said he was all smiles - loved the attention. Gavin's Physical Therapist, Miss Wendy, works with him in and out of the classroom in his walker. He uses his open walker in the classroom to transition from one activity to another...and then they cruise up and down the hallways. He is doing so well navigating himself without help!!! Then, when they go outside, he uses the KidWalk or Sara holds his hands and has him walk. Today, when they went out on the playground (which is mostly un-usable for the kids in his class - but more on that in a minute), Miss Megan helped Gavin climb up the ladder so he could go down the slide. He LOVED going down the slide! Sara told me that when he got up on his feet again at the bottom, he guided Megan back to the ladder!! This is so exciting to me. But the playground. I have issues with the playground. It's beautiful, don't get me wrong...but there's not a single swing that Gavin can use. And all of the equipment is big and perfect for typically developing kids. Brian would have a ball! This school was not designed for this "special needs classroom" - Gavin's classroom is brand new and using space in the school. 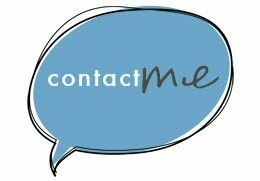 I have personally called and written to just about every swingset company in our area - begging them to donate a swing or two. Or really to donate anything. But no one seems interested, which is a bummer. There has to be a way to make this happen for these kids and I'm determined to figure it out. In other news...this Thursday I'll be keeping Gavin out of school. He has his very first visit with a Developmental Pediatrician at DuPont. This appointment was set up many, many, many months ago - it's not easy to get in! I have no idea what to expect...and, to be honest, I'm nervous for some odd reason. 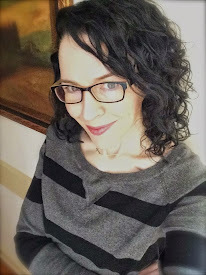 If you've been to a Developmental Pediatrician, I'd love for you to comment here on the blog with your experience...advice...tips...whatever you got, I'm all ears. Thanks in advance! What happened to Gavin's finger?